Because the notion of a professional, uniformed police force is a relatively young concept, ideas about how to best implement and practice law enforcement are continually evolving. For centuries, law enforcement focused on crime and punishment, with a greater emphasis on punishment. Certainly, harsh and humiliating punishments were believed to deter other would-be criminals, but very little time or effort was spent on discovering the reasons behind the crimes. The early histories of both criminology as a whole and of policing specifically show a less institutional approach to crime. As societies grew and evolved, criminologists began looking more and more into ways to prevent crime, while at the same time local governments began to take a more active role in policing their citizens. Though this evolution continues today, law enforcement practices began to change dramatically after Professor Herman Goldstein introduced the concept of problem-oriented policing in 1979. Goldstein's ideas spread throughout the United States and quickly lead to the development of the concept now recognized as community-oriented policing. Community-oriented policing is the culmination of the work of criminology researchers and practitioners alike. The concept shifts the focus from reaction to action. In previous policing models, police departments spent a vast amount of resources and manpower reacting to crimes that had already been committed. Instead, problem-solving policing and its offshoots emphasize building relationships to prevent crimes. The key concepts of community-oriented policing rely on two core components: community partnerships and problem-solving. Community-oriented policing brings police professionals, government officials, and community and neighborhood leaders together to identify and evaluate problems within the community and work together to solve them. It takes into consideration not only police perceptions of problems but also the desires, needs, and expectations of the community in formulating an appropriate response. Through these community partnerships, police agencies build trust and rapport with the neighborhoods they serve. It has proven essential in obtaining cooperation from groups that in the past wanted very little to do with law enforcement. Community-oriented policing employs the SARA model of problem-solving to come up with long-term solutions to crime that have less to do with the criminal justice system and more to do with changing perceptions. SARA is an acronym for Scanning, Analysis, Response, and Assessment, and refers to key steps in the problem-solving and decision-making processes. The SARA model involves four key components. Scanning involves looking for patterns of problem activities, including victims, locations, and types of crimes. It requires an evaluation of the problem, the perception of the problem by both law enforcement and external partners, and an analysis of the severity of the problem. The next phase of the problem-solving model is analysis, which includes looking for the root causes of any problems or issues identified. Information is gathered from a variety of sources, including crime reports and community members who are directly affected by the issue. Causes of problems can include many factors, including neighborhood and community perceptions of law enforcement themselves. Once the cause is identified, law enforcement officials will work with the community to come up with and execute an appropriate, long-term response. After the response is implemented, an ongoing assessment is required to evaluate the effectiveness of the solution and make adjustments as appropriate. 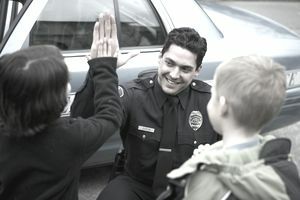 The community-oriented policing model allows police, criminologists, and other criminal justice professionals to work closely together to find the root causes of criminal activity. By applying the principles of problem-oriented policing, law enforcement professionals find long-term solutions and continue to foster trust among the citizens they serve and help to ensure a safer community.